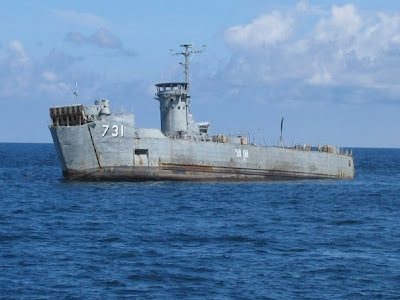 Today we finished 2 days of wreck diving in Pattaya, that's besides me, Mikhail and Steve, former IDC candidates of mine. We completed two wreck dives, one on the HTMS Koot and one on the HTMS Khram, both dives counting towards the PADI Wreck Instructor Specialty rating. That wasn't all however, we also completed a dive for Naturalist Instructor Specialty and a Drift Instructor Specialty dive. The latter being a specialty that just like the Wreck dive specialty, I don't get to teach that often, since drift diving is not really possible from Samui. Hats off to Danny at Seaduction for rescueing the day when he found out in the morning that their boat couldn't go out on the first day and he kept a cool head and arranged an alternative boat for us on very short notice. These are definately the guys to contact when diving in Pattaya. Today we dived the HTMS Khram during the first dive of the day and the visibility was really nice, a good 10 meters. Towards the end of the dive, after the safety stop but before reaching the surface my since January brand new underwater housing managed to leak somehow and my housing was flooded and the camera was history! Right now I wasn't able to retrieve the pix I took, but maybe I can retrieve them once I'm on Samui. I was not a happy camper, that's for sure! 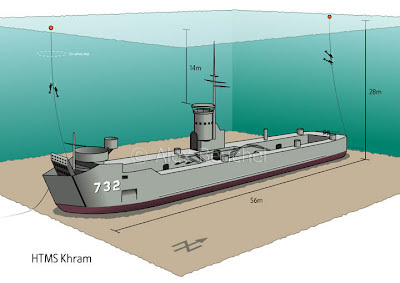 Yesterday we dived the HTMS Koot, a sister ship of the HTMS Khram. during this dive my camera still worked and below there will be some pix. The picture above is taken just before the Koot was sunk. Part of the HTMS Koot from the inside, an electricity box. This file fish was inside the Koot. This lovely crab made also an appearance during our dive on the Koot. It was a weekend well spend with some good wreck dives. For anybody who's interested in easy accessible wrecks in Thailand, well within recreational dive depths, Pattaya is your destination. Hope to see you soon in Pattaya again.